The North Harris Estate has a large red deer herd of 1100-1400 animals. The deer in the Western Isles are thought to be some of the most genetically pure red deer in Scotland. Being isolated from the mainland population they have not come into contact with the introduced Sika deer which have spread through large areas of the mainland and hybridised with red deer. 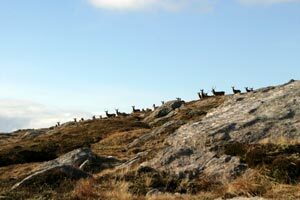 However, the origins of red deer on Harris are uncertain. It is thought that they are unlikely to have been able to swim out to colonise the islands of their own accord but it is not known when they were introduced. The Trust is currently contributing to a research study looking at Scottish red deer as a potential indicator of Climate Change. Red deer are a great asset to the Trust but their presence also brings a responsibility of management to maintain a healthy herd whilst ensuring that other parts of the sensitive upland ecosystem do not suffer. High levels of deer grazing and trampling can have a damaging effect on the sensitive vegetation communities for which the Special Area of Conservation (SAC) is designated. Our management agreement with SNH commits the Trust to maintaining the deer numbers to their current level for this reason. In order to achieve this around 50 stags and 100 hinds and calves are currently culled annually on the estate and deer counts are conducted on a bi-annual basis to monitor numbers. The culling is carried out through a combination of private leases and the Harris Stalking Club. From the early days of community ownership members of the community were keen to have the opportunity to stalk in North Harris. In order to involve the community in deer management the Trust facilitated the establishment of the Harris Stalking Club in 2004. The club is open to anyone living in Harris or the South Lochs area of Lewis and is run by its members as a separate body from the Trust. The club has been a considerable success and currently has around 25 members, 15 of whom have been trained to Deer Stalking Certificate Level 1 in stalking best practice methods and deer biology. Members of the stalking club now carry out most of the hind stalking, enabling members to enjoy the sport and the Trust to manage its deer herd successfully. Following the purchase by the Trust of the Loch Seaforth Estate in 2006 the club took on a lease for a small amount of stag stalking on the eastern part of the estate. Abhainn Suidhe castle have a lease for the stag stalking on the Western half of the estate. North Harris is a spectacular place to watch deer and the more remote glens at Cravadal, Ulladal and Langadal provide the best opportunities for views. In July you could be lucky enough to see the young calves when they start following their mothers, and in October the rut is a spectacle not to be missed; when stags are fighting to mate with hinds and their roars can be heard echoing around the corries and glens.